Car Purchaser Requested Fees Of $80,927.25, But Fee Request Reduced For Work Vindicating Car Purchaser’s Personal Interests. We found Flores v. Southcoast Automotive Liquidators, Inc., Case No. B268271 (2d Dist., Div. 5 Nov. 27, 2017) (partially published; fee discussion not published) to be interesting given how the trial judge fashioned a positive fee award to a car purchaser plaintiff under the private attorney general statute after reducing the requested fees by a ratio which reflected work spent on claims vindicating only car purchaser’s personal interests. The facts here were not particularly attractive for the car dealer, ultimately leading the trial judge to award about $38,500 in compensatory damages/penalties to car purchaser, rescind the car purchase, and entering a limited permanent injunction against car dealer as to certain advertising practices. The car purchaser then moved for attorney’s fees of $80,927.25 but the trial judge only awarded 30% for a fee award to car purchaser of $24,278.18—finding that 70% of the fees incurred were for car purchaser’s private benefit and 30% were for the public benefit. $3,922.50 in routine costs were also awarded. The fee and costs awards were affirmed on appeal. The appellate court determined that car purchaser’s action resulted in enforcement of an important right to be free of false/misleading advertisement, but sustained the trial court’s limitation of the fee award as it did based on the private/public benefit ratio analysis. BLOG OBSERVATION—This case demonstrates how settlement should not be bypassed in certain situations. After the complaint was filed, car dealer’s counsel offered to rescind the car purchase and pay for $1,500 in incidental costs (although the costs figure was negotiable if receipts could be provided to support more costs). Car purchaser’s counsel countered that the car purchaser required an additional $15,000 for civil penalties and attorney’s fees, which resulted in an impasse. As we read the decision, car dealer did much worse by going to trial rather than accepting purchaser’s settlement counter. $63,945 Fee Request Rebuffed By Both Trial and Appellate Courts. In Bonome v. City of Riverside, Case No. E065880 (4th Dist., Div. 2 Oct. 11, 2017) (unpublished), plaintiff—a Riverside Police Officer—won a writ of mandate proceeding agreeing he was entitled to a good cause hearing to determine if he was honorably retired and entitled to a Carry Concealed Weapon endorsement. He then sought to recover $63,945 in private attorney general fees. The trial court denied the request, which was affirmed on appeal. The appellate court, as was the trial judge, was not convinced this impacted a large class of persons giving the narrowness of the issue determined in plaintiff’s favor. However, Fee Multiplier Not Allowed Under Section 996.4 And Plaintiffs Did Well To Cross-Appeal Given That Costs To Prosecute 996.4 Recovery Not Allowable Under 996.4, But Was Allowable Under CCP § 1021.5. This next case counsels that a protective cross-appeal can be a true salvation. It was for the successful plaintiffs in Hosac v. County of Los Angeles, Case Nos. B267998 et al. (2d Dist., Div. 2 Oct. 10, 2017) (unpublished). What happened here is that two public employee police officers got caught up in a breach of contract action involving L.A. County. They sought defense and indemnification from the government, to no avail, but were eventually dismissed from the breach of contract action. Employees then sought recoupment of their fees and costs under Government Code section 996.4, which does allow recapture for public employees acting within their chain of command. The trial judge awarded them $473,510.75 for their strict recoupment claim, which included a multiplier on lodestar fees of $323,662.75. The lower court also awarded them $394,250-plus for fees/costs in prosecution efforts in obtaining fees, although denying the employees’ efforts to obtain them under the private attorney general statute also. County appealed, and employees protectively cross-appealed. Employees did well to cross-appeal. The Court of Appeal determined that section 996.4 only allows recovery of fees actually incurred, such that the multiplier amount could not be allowed but only the $323,662.75 lodestar amount. As far as the secondary 996.4 award, the appellate court agreed there was no statutory basis for such an award under 996.4 but did determine the employees were entitled to it under CCP § 1021.5 based on their cross-appeal—after all, they vindicated an important right to follow the chain of command and should not be denied fees on that basis. So, in the end, employees ended up with $736,097.98 as the total fees/costs award—not bad, not bad. Individual Did Not Demonstrate Any Systematic Police Department Violation. In Barry v. The Los Angeles County Sheriff’s Dept., Case No. B275359 (2d Dist., Div. 5 Oct. 10, 2017) (unpublished), plaintiff prevailed narrowly on a writ of mandate requiring a remediation of his rap sheet under certain Penal Code provisions. The trial judge refused to award him attorney’s fees under the private attorney general statute because the remediation of his rap sheet did not amount to enforcement of a public right. The appellate court affirmed, because individual petitioned for mandate as an individual and he writ of mandate only benefitted him personally rather than any other person. This was buttressed by the fact that plaintiff showed no systematic violation by the police department. Result Was To Affirm A $470,461.55 Fee And $15,511 Costs Awards. Who says that fee and costs awards under California’s private attorney general statute cannot be substantial in nature? Surfrider Foundation v. Martins Beach 1, LLC, Case Nos. A1442681/A145176 (1st Dist., Div. 5 Aug. 9, 2017) (published) demonstrates they can, and frequently, are. Nonprofit Surfrider Foundation, well known in this area, won a challenge to activities involving closure of public access before the owners obtained a coastal development permit, vindicating policies under the California Coastal Act. The trial judge awarded Surfrider $470,461.55 (out of a requested $609,176.93) in fees and $15,511 (full request) in costs. The opposition challenge to the fee award did not “score” on appeal. Although this case is must reading for land use practitioners in the “takings” public trusts area, the 1/5 DCA found that (1) the Coastal Act policies being vindicated did constitute a public benefit; (2) a significant benefit of precedential value was obtained involving the interpretation of a “development” under the Coastal Act; (3) government was not concerned with the coastal development permit issue; and (4) Surfrider’s general nonpecuniary interest in protecting beach access did not disqualify it from section 1021.5 fee entitlement. Limited Success Has To Be Considered On Remand. 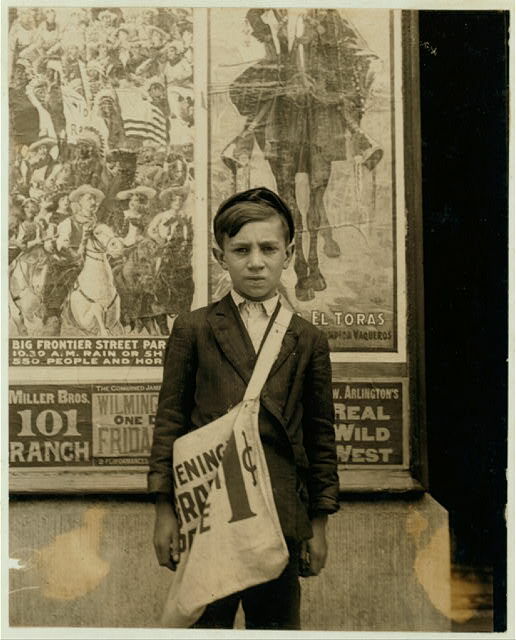 "S. Russell, 33 E. 22nd St. Newsboy, 12 years of age. Selling newspapers 2 years. Average earnings 20 cents daily. Selling newspapers own choice. Father earns $18 weekly Boy deposits earnings in du Pont Savings Bank, and on Saturday night works for Reyold's candy shop, delivering packages. Don't smoke. Visits saloons. Works 5 hours daily, except Saturday, when he works 11. Location: Wilmington, Delaware." Photographer: Lewis Wickes Hine. May 1910. Library of Congress. Espejo v. The Copley Press, Inc., Case No. D065397 (4th Dist., Div. 1 July 7, 2017) (published) was a class action brought by home newspaper delivery carriers of the San Diego Union-Tribute claiming they were misclassified as independent contractors rather than employees. Because there was an unfair competition claim, the trial was bifurcated and the first phase went to the court for determination given that a 17200 claim is equitable in nature. The trial judge awarded a total compensation judgment of about $5 million. Then, under CCP § 1021.5 (the private attorney general statute), the trial judge awarded fees of $6,160,416, although determining that no fees were allowable under Labor Code section 2802 based on plaintiffs’ abandonment of certain claims. The Court of Appeal affirmed in part, reversed in part, and remanded based on appeals by both sides. The basic reason for reversal in favor of the newspaper was that the trial judge did not consider offsets for certain payments made to carriers. This necessitated a relook at the fee award as well, with the appellate court observing that a possible fee reduction might be in order based on limited success under the Hensley federal test applied in 1021.5 cases. The 4/1 DCA also found it was not error to deny a positive multiplier and sustained the 2802 abandonment ruling. Re-Do Was The Result In This One. In Seltzer v. R.W. Selby & Company, Inc., Case No. B270168 (2d Dist., Div. 2 May 3, 2017) (unpublished), a trial judge in a class action case awarded $29,409 in attorney’s fees to class counsel under the private attorney general statute based on the percentage-of-recovery method rather than the lodestar method. Class counsel has requested a lodestar of almost $473,000 plus a multiplier based on risk. The class recovery was $88,227, such that the actual fee award was a third of that. The 2/2 DCA reversed. Notwithstanding the equities, the appellate court determined that the lodestar method had to govern as a matter of law based on Serrano v. Priest, 20 Cal.3d 25, 48, fn. 23 (1977) (Serrano III) when it came to a private attorney general recovery. Even though the percentage-of-recovery method could be used as a cross check, the lodestar governed until Serrano III is abrogated for 1021.5 purposes, according to the appellate court. A re-do was required, one based on the lodestar methodology. In Fact, First Win Was One To Enforce Environmental Laws. Botanical Building in Balboa Park. May 2013. Carol M. Highsmith, photographer. Library of Congress. In Save Our Heritage Organisation (SOHO) v. City of San Diego, Case No. D070006 (4th Dist., Div. 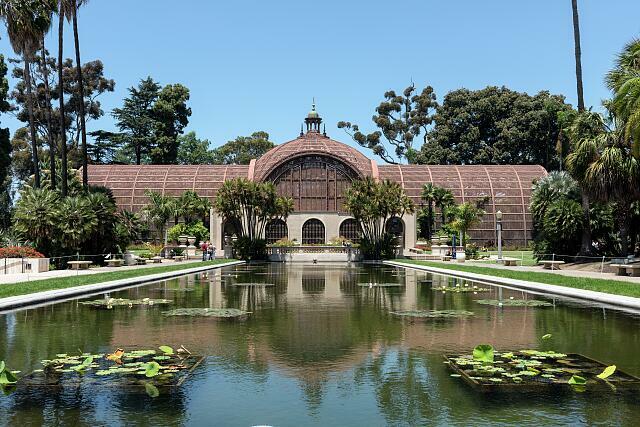 1 April 27, 2017) (published), a certain Committee, proponent of a project to revitalize Balboa Park in San Diego, obtained reversal of a prior mandamus judgment in favor of SOHO and against the City of San Diego by which the project was rescinded. Environmental and other legal concerns inspired SOHO’s opposition. After reversal, Committee sought an attorney’s fees award under the private attorney general statute, CCP § 1021.5, a request denied by the trial court. The denial was affirmed on appeal. Although finding the Committee as a project proponent was not disqualified from fee entitlement recovery under § 1021.5, the appellate court determined that SOHO should not be the victim of a 1021.5 fee award because it did not act to compromise public rights. In fact, it sought to enforce legal and environmental concerns, albeit ultimately unsuccessful. The Court of Appeal obviously was concerned with chilling rights for litigants in the position of SOHO. Remanded For A "Re-Look" Of Fee Denial On Two Grounds. Ox as "ye oppressed tax-payer" pulling cart of municipal, county, poor, state, courthouse, road, school, and local taxes. George Yost Coffin, creator. 1880-1900. Library of Congress. Although involving a somewhat complicated probate partnership reassessment dispute where the public agency found the tax appeal was untimely, Bent v. The Los Angeles County Assessment Appeals Board, Case No. B270835 (2d Dist., Div. 2 Apr. 11, 2017) (unpublished) does demonstrate that a fee request denial can result in a remand where the trial judge did not follow the correct legal standards—in that situation, an abuse of discretion did occur. There, plaintiff actually obtained reversal of a determination that his tax appeal was untimely filed even though eventually losing on the merits. His $153,281.25 fee request under the private attorney general statute was denied, and his $7,500 request for fees under Government Code section 800 (allowing this amount for capricious public agency action in an administrative setting) was denied. The 2/2 DCA reversed the fee denials. On the 1021.5 request, it was determined that: (1) the lower court looked only at the taxpayer's motive rather than broader societal importance on the public interest enforcement prong; (2) the trial judge found that taxpayer only enforced existing law and had a personal stake in the matter, legally erroneous because a substantial benefit can flow from enforcement of existing rights and a personal stake does not disqualify a litigant from seeking 1021.5 fees under the significant benefit prong; and (3) the lower court did not engage in a proportionality analysis on the financial burden prong, focusing only on the financial motivation for the taxpayer to file the appeal. On the 800 request, the public agency showed no substantial reason as to why it ignored a statutory taxation provision in contesting things below. Reversed and remanded, although no opinion was expressed on how discretion should be exercised once the proper legal standards were adhered to. Substantial Benefit And Financial Burden Elements Easily Met. Women with ukuleles. July 9, 1926. Library of Congress. Well, we wish Retired Justice Robert Mallano the best in retirement; and, to show that he is not just playing a ukulele, the 2/2 DCA affirmed the merits and an attorney's fees award in his favor in a class action challenging the State's formula used to make payments and benefits to retired judicial officers. In Mallano v. Chiang, Case No. B272124 (2d Dist., Div. 2 Apr. 5, 2017) (unpublished), he was awarded $659,756 in attorney's fees under CCP § 1021.5 for prevailing on his claims. That was sustained on appeal, with the reviewing court determining that (1) the case did confer a substantial benefit given that judicial compensation is of state-wide interest as far as vested compensation rights and the case likely meant the State has to fund $13 million more for 1,800 judicial retirees; and (2) the case was one where the financial burdens of litigation easily outstripped any individual interest based on Retired Justice Mallano only receiving $17,898.13 in unpaid wages/salary given the enormous litigation costs against the State for prevailing. Published Decision Helps, But Not A Requirement In This Area With Respect To Significant Public Benefit Issue. 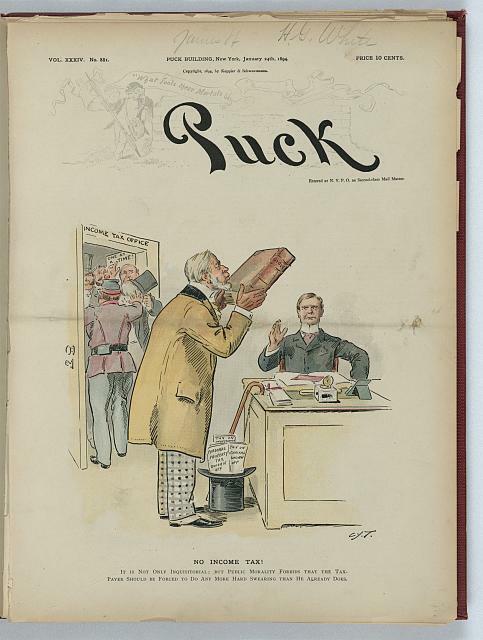 “Print shows a scene at the ‘Income Tax Office’ with a crowd clamoring at the door where a notice states ‘One at a Time’; inside, a wealthy man is standing by a desk, on the floor at his feet, in his hat, are papers labeled ‘Personal Property Tax Sworn Off’, ‘Tax on Capital Sworn Off’, and ‘Tax on Investments’, he kisses the Bible while a government official sits at the desk with his right hand raised.” Library of Congress. 1894. Charles Jay Taylor, artist. In Ventura Office Suites v. California Unemployment Insurance Appeals Board (Board), Case No. B269664 (2d Dist., Div. 6 Jan. 17, 2017) (unpublished), Ventura Office Suites (VOS) had to fight to the appellate level to obtain a ruling (albeit unpublished) that it had the right to judicial review of the Board’s employee status determination for unemployment insurance benefit purposes without paying the tax/unemployment insurance contribution (“pay now, litigate later” rule). VOS then filed to recover $201,308,13 in attorney’s fees (inclusive of 1.5 multiplier request), but was eventually awarded $68,526.80. VOS was satisfied, but Board was not—it appealed. The 2/6 DCA affirmed the fee award. It found that a significant public benefit was conferred by VOS’ fight along the way, even though it was vindicated through an unpublished appellate decision. No binding precedent is necessary under § 1021.5 in order to confer a significant benefit on the general public. With respect to the financial burden element, this was easily met: VOS would have saved only $1,120 per year versus incurring at least ten times the fees if this case was litigated on an hourly basis (presumably this was taken on a pro bono/contingency type of arrangement). Financial Incentives Element Clarified In 1/1 DCA Unpublished Decision Which Is Now On The Books. On October 2, 2016, we posted on Millview County Water Dist. v. State Water Resources Control Bd., an unpublished September 28, 2016 1/1 DCA decision which reversed a private attorney general statute fee award to a plaintiff, clarifying the nature of the financial incentives element of CCP § 1021.5 in the process. We can now report that the decision was certified for publication on October 26, 2016. Voluntary Reduction By County Was Due To Retirement Of Certain Employees, Not Change In Methodology By Which Fees Calculated Such That Plaintiff Was Not Successful For 1021.5 Purposes. California Public Records Research, Inc. v. County of Yolo, Case No. C078158 (3d Dist. Oct. 14, 2016) (published) involved a plaintiff’s challenge to the fees charged by the Yolo County Recorder’s Office. Eventually, the County did reduce fees voluntarily after the litigation based on certain senior staff members retiring, although the methodology for calculation of fees was not changed by the mandamus petition at all, which was denied on the merits through a summary judgment proceeding. Plaintiff then moved to recover $450,000 in attorney’s fees under the private attorney general statute on a “catalyst” theory (based on the voluntary County reduction in fees), but the lower court denied the request. Plaintiff lost both merits and fee denial challenges on appeal. As far as the fee denial, the appellate court reasoned that plaintiff was not successful in achieving its primary litigation objective through a change to the method in which County calculated recordation fees. Although it did voluntarily reduce fees when certain staff members retired, the litigation resulted in no change in the way in which it calculated fees. The fee denial was correct. Plaintiffs Failed To Satisfy Financial Burdens Elements of CCP § 1021 Analysis. Plaintiffs successfully challenged a State Water Resources Control Board cease and desist order (CDO) in a water diversion case, which resulted in an affirmance in favor of plaintiffs in a prior published decision. Based on that result, plaintiffs moved to recover private attorney general fees under CCP § 1021, with the lower court awarding such fees for work on the prior appeal but denying fee recovery on other work efforts. Both sides appealed, the Board from the appellate fee recovery and plaintiffs from the denial of fees for other work. The Board won big on appeal in Millview County Water District v. State Water Resources Control Board, Case No. A145428 (1st Dist., Div. 1 Sept. 28, 2016) (unpublished), obtaining a reversal of the appellate fee recovery and an affirmance of the “other work” fee denial. The reason for the reversal was that plaintiffs failed to demonstrate with substantial evidence that the financial burden element, as articulated in In re Conservatorship of Whitley, 50 Cal.4th 1206 (2010) [one of our Leading Cases, #14], was satisfied. Quite to the contrary, one group of plaintiffs earned $1.6 million under a purchase agreement by the CDO result, while another plaintiff preserved an asset that would have become worthless absent the CDO challenge. Although plaintiffs vigorously argued that LA Police (a pre-Whitley case) on the financial burdens element dictated a different result, the 1/1 DCA decided that LA Police was not the right test based on the “financial incentives” test governing post-Whitley. In doing so, the appellate court relied heavily on reasoning from Summit Media, LLC v. City of Los Angeles, 240 Cal.App.4th 171 (2015), discussed in our September 9, 2015 post. First Impression Issue, But Unique Circumstances, Required Reversal Of Fee Grant Involving Substantial Fee Recovery To Nonprofit. This case shows how unique factual circumstances can drive cases, especially in the attorney’s fees recovery area of the law. Hold on, this is a wild ride but not necessarily given the unique factual circumstances involved. In City of San Diego v. San Diegans For Open Government, Case Nos. D068939/D069890 (4th Dist., Div. 1 Sept. 22, 2016) (published), a nonprofit corporation brought an ultimately successful validation action against City on a plan to levy a special tax to finance the expansion of the San Diego Convention Center. But, there was a “retro” hitch: nonprofit was a suspended corporation at the time that it filed an answer as an interested party, a fact known to both the nonprofit and its counsel, and a fact never revealed to the trial judge or the City—despite the fact that validation actions are governed by a very fast statute of limitations by prosecuting parties. Nonprofit, despite this nondisclosure and after prevailing, moved to recovery private attorney general fees under CCP § 1021.5, with the lower court expressing great concern about the nondisclosure but nonetheless awarding partial fees to the tune of $258,629.89 in favor of nonprofit and against City. City successfully appealed the fee recovery in favor of the nonprofit entity. Although grounded in the specific facts at issue (but one of first impression), the appellate court reversed completely the fee recovery because it found that the nonprofit’s suspension during a critical statute of limitations time to respond, in tandem with the lack of candor by the nonprofit and its counsel, justified fully a denial of fees under a public interest-oriented statute. Lower Court Fee Award Affirmed, An Award We Reviewed Earlier. In our March 6, 2015 post, we discussed a private attorney general fee award of a little shy of $722,000 to Mr. Weiss in a case where he successfully challenged the City of Los Angeles’ delegation of initial review of parking citations to an outside processing agency. We can now report that this litigant’s wins, both on the merits and on the fee award, were recently affirmed in Weiss v. City of Los Angeles, Case No. B259868 (2d Dist., Div. 4 Aug. 8, 2016) (published). The City challenged the fee award on the grounds that neither a public interest was vindicated nor a significant benefit was achieved under Code of Civil Procedures section 1021.5. The appellate court rebuffed these challenges. Getting the right tribunal to review parking citations is an issue of public importance, a significant benefit was achieved by having the City to face accountability for this review (versus a private outside company), and City itself had to admit that the action resulted in a “complete change” in how it was doing things in this area. Fee award affirmed. Significant Benefit Conferred When Law Enforcement Agencies Are Ordered To Implement The Law Correctly. In Schmidt v. California Highway Patrol, Case No. B260643 (2d Dist., Div. 6 Aug. 1, 2016) (published), a class was certified and a writ petition granted in a case to compel the California Highway Patrol (CHP) to comply with Penal Code provisions to file certificates showing an arrest as a detention where a person is arrested and released in situations where no accusatory pleading is filed. The CHP did not comply with the appropriate Penal Code provisions, resulting in a writ of mandate requiring compliance with the law and awarding class representative $296,100 in attorney’s fees pursuant to CCP section 1021.5, California’s private attorney general statute. State [Louisiana] Highway Patrolman talking with truck driver. John Vachon, photographer. March 1943. Lib. of Cong. CHP’s appeal was unsuccessful both on the merits and in overturning the fee award. The appellate court found that the class action did confer a significant benefit on the general public given that the CHP was misinterpreting statutes designed to benefit the public. “Society as a whole benefits when law enforcement agencies properly interpret and implement the law.” Fee award affirmed. Both Sides Appealed, But Lower Court Award Affirmed. 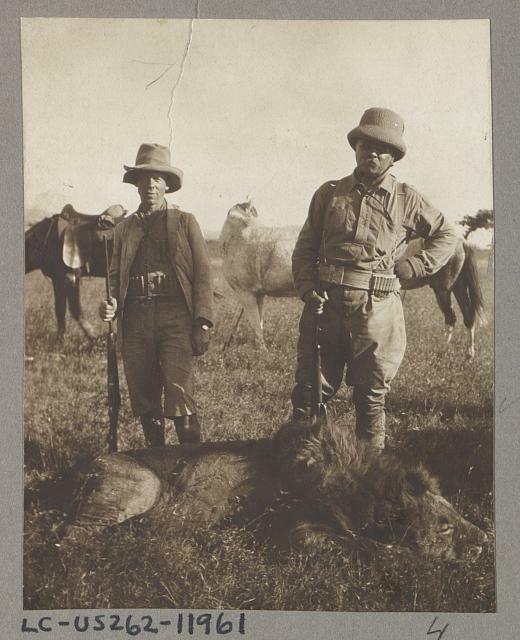 Above: Col. Roosevelt, Tarlton, and the big lion. Photographer: Kermit Roosevelt. c1919. Library of Congress. Exotic Feline Breeding Compound v. Dept. of Fish and Wildlife, Case No. F070449 (5th Dist. June 22, 2016) (unpublished) involved the Department of Fish and Wildlife’s appeal of a $134,417 fee award under CCP § 1021.5 to a winning nonprofit devoted to preserving exotic animals on a wide scale basis. However, nonprofit cross-appealed claiming the fee award was not enough. Both sides went home disappointed on appeal. Plaintiff nonprofit did meet the § 1021.5 criteria, especially given that the Fish and Game Code has a legislative mandate to shelter restricted live animals, such that the public interest factors were met. Plaintiff was successful in obtaining mandate to overturn a breeding zoo waiver denial relating to a permit for exotic animals. No one else was vindicating these interests. As far as financial burden, the cost of a permit was $3,000 versus the many, many hundreds of thousands to prosecute this matter as far as litigation expenses. Finally, plaintiff’s cross-appeal did not get every far given that the lower court was reasonable in determining that the awarded amount was reasonable on appeal, after taking into account many factors. $70,000 Fee Request Rebuffed By Trial And Appellate Courts. In Hillis v. City of Aliso Viejo, Case No. G051900 (4th Dist., Div. 3 June 2, 2016) (unpublished), plaintiff successfully contested a nonconforming traffic sign infraction against City, obtaining a dismissal of a criminal charge. Plaintiff’s father asked the City to remove the offensive sign, prompting plaintiff to file a class action to remove the sign. Eventually, the sign was removed. Plaintiff then moved for attorney’s fees under the private attorney general statute based on his contention he was a catalyst for sign removal. He sought a little under $70,000 in fees, a request denied by the trial court. The appellate court affirmed, in a 3-0 decision by Justice Thompson. Although the lower court agreed that plaintiff’s lawsuit was a catalyst for the sign removal, the problem was that no public benefit was vetted given that only one traffic sign was at issue. A cautionary message to the public entity is insufficient to satisfy the public benefit requirement of CCP § 1021.5. (Norberg v. California Coastal Com., 221 Cal.App.4th 535, 543 (2013).) The fee denial was sustained on appeal. Traffic Infraction Winners May Face Hard Road to Hoe As Far As Fee Recovery. In Gray v. Superior Court, Case No. B269150 (2d Dist., Div. 3 May 31, 2016) (published), a person failing to stop at a red light partially won an automated camera traffic enforcement challenge, with the person filing to recovery attorney’s fees under the private attorney general statute because he vindicated public interests in a criminal case under Penal Code section 1466(b)(2). The trial court denied the fee request, which prompted an appeal to the Appellate Division. The Appellate Division concluded the fees did not implicate criminal defendant’s substantial rights such that the court’s order denying fees was not appealable or subject to writ relief. Defendant did not win before the “second” appellate court (2/3 DCA). Because the denial of a fee request only involved personal property, the appellate court agreed that no substantial rights were at issue under section 1466(b)(2). Ultimately, the Appellate District did not abuse its discretion by refusing to award 1021.5 fees under the circumstances. Both Went Away Unhappy, We Assume. In Russo v. Bank of America, Case No. D067623 (4th Dist., Div. 1 May 17, 2016) (unpublished), borrower and lender won some sides of claims in an impound dispute, although plaintiff borrower eventually won $523.14 based on a contract with a fees clause after seeking $795,000 plus punitive damages. Lender had made two CCP § 998 offers for $100,000 and later $250,000 plus potential $115,000 in attorney’s fees, offers rejected by plaintiff. The lower court denied dueling attorney’s fees requests by both sides. Both sides appealed to no avail. As to borrower’s claims to fees under Civil Code section 1717 and Code of Civil Procedure section 1021.5, the trial judge did not err in concluding that borrower had very limited success so as to not prevail under section 1717 and that borrower was furthering his own interest rather than a broader public interest under section 1021.5. The lower court’s conclusion that the section 998 offers were not made in good faith somewhat bothered the appellate court, which acknowledged that there is a split in thinking but adopted the view there is a good faith requirement to section 998 and that the trial judge must put itself in the shoes of both parties when evaluating the 998 offer. With this in mind, plaintiff rightfully rejected the offers as not being in good faith because plaintiff had a stroke at the time and impound account was eventually cancelled. Although the opinion did not discuss what lender had sought, borrowers’ request for $175,635 in fees was rejected at both judicial levels. Fee Request of Over $1.785 Million Denied In Entirety. For intervening parties in suits with potential fee recovery in CCP § 1021.5 cases, San Diego Municipal Employees Assn. v. City of San Diego, Case No. D066886 (4th Dist., Div. 1 Feb. 9, 2016) (published) is a stark reminder that you must bring something material to the table—if not, you risk getting no or very minimal fees. In this case, four employee labor unions intervened in an action on employees’ behalf asserting the same or similar arguments (with some nuances) as the municipal entities carrying the load in this case. After the case was settled, the unions sought to recover $1,785,147 in attorney’s fees under the private attorney general statute, CCP § 1021.5. Both the lower and appellate courts said, eloquently and politely, naught! The reason for the fee denial was not petty or punitive in nature. Rather, it was determined that the necessity element of section 1021.5 was not satisfied. Intervening parties, in situations where a public entity’s parallel advocacy was primary and might carry the day, must show they proffered significant factual and legal theories and produced substantial, material evidence which was not merely duplicative or cumulative to what was advanced by the governmental agency. That is the test adopted by the appellate court (Slip Op., p. 8), so, intervening parties, you are put on notice for your burden of proof in future section 1021.5 cases. Pro Tem Justice Prager, a San Diego County Superior Court judge sitting by assignment, authored the 3-0 opinion. Need For More Expensive Out-Of-Venue Counsel Was Well Justified By Fee Claimant. In Habitat and Watershed Caretakers v. City of Santa Cruz, Case No. H040762 (6th Dist. Oct. 6, 2015) (unpublished), both plaintiff and City appealed a lower court’s decision awarding plaintiff fees of about $250,000 (out of a requested $486,800 on the lodestar and about $30,000 for “fees on fees,” a 60% reduction on the fees on fees request) under California’s private attorney general statute, CCP § 1021.5. No one contested entitlement, just the amount of the fee award—City claiming too high, and plaintiff contesting the lower court’s application of a 50% negative multiplier on lodestar and the “fees on fees” reduction. The lower court reduced the lodestar 50% for partial success ($226,725 total) and cut the “fees on fees” request by 60% as indicated above ($22,199.90, which gets to the “total total” of about $250,000) being reviewed. Plaintiff got the better end of its challenge on appeal. City’s appeal did not resonate because plaintiff did a nice job of showing it needed to obtain Oakland counsel out of the Santa Cruz area, given it could not find anyone else with the expertise or willingness to take a contingent basis. Plaintiff also used Mr. Richard Pearl as a fee expert to justify the higher hourly rates and demonstrate they were commensurate with rates charged by Bay Area practitioners. Also, the contingent nature of the representation justified a higher hourly lodestar rate. However, the Sixth District was concerned with the downward adjustment of the lodestar for “partial success.” The problem is that the lower court may have confused not being successful with claims from not being successful with theories. Here, it looked like plaintiff did obtain success on all the claims, although it did admittedly lose on some theories/contentions. But this meant that the downward adjustment needed to be reexamined. While this was being done, the “fees on fees” determination should be reassessed, with the reviewing court somewhat alluding to its belief that the 60% cut was a little excessive in amount. Winner Vindicated Important Right To Initiative Tenets And 1021.5 Fee Award Can Be Made Against Losing Individual Litigant. In Bogan v. Houlemard (Campbell), Case No. H041246 (6th Dist. Sept. 30, 2015) (unpublished), one individual litigant, who was a proponent for an initiative on the Monterey County ballot, won a defense effort against another individual litigant’s mandate petition to get a dueling initiative submitted for voter approval. The winning litigant obtained a private attorney general fee award against losing individual to the tune of $86,909.34. Disgruntled litigant did not win on appeal. The main reason was that the right to an initiative was a significant public benefit vindicated by winning litigant, who was pretty much vindicating it alone and with no indication he had any financial “skin” in the game. Put these factors together, and 1021.5 fees were justified. (Wal-Mart Real Estate Business Trust v. City Council of San Marcos, 132 Cal.App.4th 614, 622-624 (2005).) Also, nothing in 1021.5 indicates that a fee award cannot be made against an individual plaintiff, just as it can be made against losing corporations/governmental entities. (Adoption of Joshua S., 42 Cal.4th 945, 958 (2008).) Fee award affirmed. Chang v. Chang, Case No. G049309 (4th Dist., Div. 3 Sept. 29, 2015) (Unpublished; Ikola, J.).—Probate. In this and a companion appeal, the appellate court cut some surcharges to the trustee of about $345,000. Because of this companion ruling, the appellate court sent back a $187,900 fee award against trustee and in favor of beneficiary (his brother) under Probate Code section 17211(b). The surcharge cut might impact the lower court’s view of whether fees should be the same or different. L.A. County Regional Park and Open Space Dist. v. City of Whittier, Case No. B257541 (2d Dist., Div. 1 Sept. 29, 2015) (Unpublished)—Private Attorney General. Petitioner won mandate based on a contract-based claim under a project agreement with Whittier, but not claims based on Proposition A violations, the public trust doctrine, and CEQA. Petitioner moved to obtain fees of $1,105,651.20 under CCP § 1021.5, but the trial and appellate said “no.” The reason was that vindication of contractual rights alone was not equivalent to vindication of a significant public right under 1021.5. Cooter v. Angeles National Golf Club, Case No. B245137 (2d Dist., Div. 7 Sept. 29, 2015) (Unpublished)—Civil Rights/Costs. Here, the appellate court reversed an order denying in part a FEHA losing plaintiff’s motion to strike certain routine costs incurred after a CCP § 998 offer. In doing so, the appellate court determined that the expert fees awarded under 998 were proper because they do not have to survive the frivolous/unreasonable standard. (Holman v. Altana Pharma U.S., Inc., 186 Cal.App.4th 262, 282 (2010).) However, the award of other routine costs had to be reexamined to see if the action was frivolous/unreasonable/without basis after the state supreme court’s ruling in Williams v. Chino Valley Independent Fire Dist., 61 Cal.4th 97 (2015). Gray1CPB, LLC v. Gulfstream Finance, Case No. G047966 (4th Dist., Div. 3 Sept. 29, 2015) (Unpublished) (Moore, J. )—Discovery Sanctions. Last but not least, the court of appeal affirmed more than $159,000 in monetary sanctions against a party for discovery abuse, based on 30 reports from a discovery referee, but reversed as to another party not given adequate due process notice of the sanctions until a too-late point in one discovery referee proceeding. Company’s Financial Interest Outstripped Broader Public Interests, With Interesting Discussion Of Settlement Communications And Whitley Analysis Where No Monetary Award Sought By Fee Claimant. Summit Media LLC v. City of Los Angeles (CBS Outdoor LLC), Case No. B255050 (2d Dist., Div. 8 Sept. 8, 2015) (published) is a nice addition to CCP § 1021.5 jurisprudence and also cautions a fee claimant to be careful what you put in merits declarations/settlement communications—the latter may come to “bite you” when it comes to subsequent fee proceedings. In this one, Summit Media successfully challenged an illegal settlement agreement between two outdoor advertising companies to digitize many existing billboards. Summit Media then moved for significant recovery of attorney’s fees/costs under section 1021.5--$2.618 million for trial work and almost $235,000 for appeal work, totaling more than $3 million by the time of the fee motion. The lower court denied the fee request, determining that the financial burden on Summit Media was not disproportionate to its individual stake in the matter. The Second District, Division 8, in an opinion authored by Justice Grimes, affirmed the fee denial. A big problem for Summit Media was that it introduced merits testimony indicating that the action was a competitive game saver and possibly one commenced for its economic survival. But there was more—Summit offered to settle the litigation for $10 million in a settlement offer. Based on this, the reviewing court found more than enough support for the fee denial based on the Whitley cost/benefit analysis on the financial interest factor of section 1021.5. In a footnote, it found that no settlement evidentiary privilege prevented admitting the settlement offer for the limited purpose of assessing financial burdens and incentives under the private attorney general statute. The nice aspect of this published decision, with respect to 1021.5 jurisprudence, is that it held a claimant seeking no monetary award could still be held to have an overriding financial interest and, separately, that even an “indirect” financial interest—in this case, competitive survival—certainly allowed trial judges to consider such an interest (gauging whether it was real or speculative in nature). Neither A Significant Public Right Vindicated Nor Significant Benefit Conferred. Not every vindication of a statutory right is worthy of private attorney general fees under CCP section 1021.5. Contra Costa County Deputy District Attorneys’ Assn. v. County of Contra Costa, Human Resources Dept., Case No. A140669 (1st Dist., Div. 3 Aug. 21, 2015) (unpublished) illustrates this principle in the 1021.5 area. There, the Deputy DA Association did obtain a writ of mandate where the County hired a deputy district attorney off an expired employment list in violation of Personnel Management Regulation 608, but did not obtain broader relief such as compelling the County to follow its PMRs. The lower court subsequently denied the Association’s request for an award of 1021.5 fees. Future Pecuniary Interest Was Too Speculative To Disqualify Successful CEQA Petitioner. In Ocean View School Dist. v. City of Huntington Beach, Case No. G049545 (4th Dist., Div. 3 July 24, 2015) (unpublished), petitioner OVSD sought decertification of a final environmental impact report (FEIR) approved by Huntington Beach (City) for a mixed-use “conceptual” project for property located at Beach Boulevard and Warner Avenue, bringing a CEQA mandate petition against City and the proposed project developer which sought decertification and requested attorney’s fees recovery under CCP § 1021.5. City itself decertified the FEIR, triggering OVSD to move for 1021.5 fees. The trial court denied the request, finding that OVSD failed to show it did not have a pecuniary interest in the litigation given some hearing statements that OVSD might in the future have to incur $2 million to open a closed school in order to meet student needs if the project went through. OVSD argued that there was no formal project at the time of the FEIR, so any pecuniary interest was speculative, but the trial judge did not buy it. The Fourth District, Division 3, in a 3-0 panel authored by Acting Presiding Justice Moore, reversed and remanded. The trial judge did properly deny the fee motion as to the private entity developer, because a private entity cannot be made to pay a public agency’s fees under 1021.5 (although not discussed, absent an indemnity arrangement). In remanding the fee request as against City, the appellate court did indicate that the trial judge could consider the City’s argument that OVSD did not confer a significant benefit, even though this argument had not been raised previously. Candidacy Mis-description Dispute Involved One’s Personal Interests. On July 3, 2015, we posted on Willard v. Kelley, where the Fourth District, Division 3 in an unpublished decision affirmed the denial of attorney’s fees to a party in a candidacy mis-description dispute, ultimately determining that the party’s personal interest was not transcended for CCP § 1021.5 purposes. We now report that the decision was certified for publication on July 21, 2015. Judgment Saying “Fees According To Proof” Did Not Determine Entitlement, And Winners Did Not Satisfy Private Enforcement Element Of 1021.5. The owners denied fees did not get a reversal on appeal in Pavan v. Walmer, Case No. C073012 (3d Dist. July 10, 2015) (unpublished). Owners first argued that the presiding judge had no jurisdiction to deny the fee request given the “according to proof” language in the assigned judge’s judgment. The appellate court did not believe this phrase meant that the assigned judge had determined fee entitlement already, given that 1021.5 fee requests are usually considered at a postjudgment stage where five elements must be satisfied under the private attorney general statute. On the merits of the fee entitlement issue, the Third District found that the lower court correctly denied it on the private enforcement issue—with the record showing that the private enforcement of the offer of dedication was not really necessary given that the City defended it well in the overall case. Opinion Deals With Causation Element Of CCP § 1021.5 Catalyst Analysis. On June 14, 2015, we posted on Coalition for a Sustainable Future in Yucaipa v. City of Yucaipa, Case No. E057589 (4th Dist., Div. 2 June 8, 2015), which was unpublished at the time. This decision dealt with the causation aspect of catalyst analysis under CCP § 1021.5. We can now report that it was certified for publication on July 6, 2015. No Important Right Or Significant Benefit Vindicated. Not all political “victories” give rise to private attorney general fee recovery under CCP § 1021.5, as the next case illustrates. In Willard v. Kelley (Woolery), Case No. G050340 (4th Dist., Div. 3 June 29, 2015) (unpublished), one political opponent (Willard) challenged a portion of his opponent Woolery’s candidate designation as “Orange County Treasurer/CPA” as being inaccurate because it was not his principal occupation. The trial court denied the petition, directed against the Orange County Registrar of Voters, based on the ground that Woolery’s stated occupation satisfied Election Code requirements. Woolery then requested an award of $8,320 in attorney’s fees under the private attorney general statute, a request denied by the trial court. That determination was upheld on appeal, in an opinion authored by Justice Fybel. The primary reason for affirmance was that factual accuracies relating to one candidate’s personal history, versus a battle over one’s views as a candidate, did not transcend beyond a candidate’s personal interests so as to confer a significant benefit to the electorate. (Hammond v. Agran, 99 Cal.App.4th 115, 121 (2002).) Fee recovery was properly denied in this one. Fee Recovery Assessed Against County And Developer Equally Ruling Was Also Affirmed On Appeal. Limited success in public interest cases is an important factor that can lead to a substantial reduction in fees awardable under California’s private attorney general statute, CCP § 1021.5. That is what happened in North County Watch v. County of San Luis Obispo, Case No. B255901 (2d Dist., Div. 6 June 18, 2015) (unpublished). There, plaintiff won on two issues among a multi-pronged attack on eleven claims brought mainly under CEQA, but not obtaining a set aside of the EIR on a project in claims brought against the developer and County. Plaintiff then moved for recovery of attorney’s fees in the range of $268,000 - $312,000 (inclusive of a multiplier request), even though the trial judge asked for supplemental briefing and explanations mainly from plaintiff. Ultimately, the trial judge awarded only around a total of $66,380 (inclusive of a 1.3 multiplier fee portion) based on plaintiff’s limited success, split in assessment against the developer and County. Both plaintiff and County appealed, to no avail. The limited success indeed was an important factor justifying the lower court’s reduction in the fee request to what was actually awarded. (Save Our Uniquely Rural Community Environment v. County of Santa Barbara, 235 Cal.App.4th 1179, 1183 (2015) [1021.5 fee request of $231,098 reduced to fee award of $19,176 where claimant only prevailed on one of six CEQA arguments].) The lower court also properly reduced the request for an award of 126.4 hours for “fees on fees” work down to 20 hours given that plaintiff only obtained ultimate fee compensation for 100 hours. Bottom Line Was Important Shopping Center Store Lost Interest. Ya know, some cases boil down to very simple principles, if not all of them. The next one is a case in point. In Coalition For A Sustainable Future In Yucaipa v. City of Yucaipa, Case No. E057589 (4th Dist., Div. 2 June 8, 2015) (unpublished), petitioner lost a CEQA challenge to a shopping center, with its interim appeal deemed moot after the project died when Target backed out of the project. Petitioner moved for CCP § 1021.5 fees, arguing it was a “catalyst” for what happened. The trial and appellate courts disagreed. The litigation was not a catalyst. Instead, Target lost interest in the project, such that petitioner did not satisfy the “successful party” much less causation elements of section 1021.5. Fee denial affirmed. City’s Confession Of Error Early On Did Not Retard Fee Recovery. Harbor Seal. Wordless symbol at English Wikipedia. Creative Commons Attribution-Share Alike 3.0 Unported. Animal Protection and Rescue League v. City of San Diego, Case No. D065178 (4th Dist., Div. 1 May 27, 2015) (partially published; fee entitlement, but fee amount/costs discussion not published) involved plaintiff arguing the need for a year-round guideline rope at the La Jolla Children’s Pool to protect harbor seals from humans. City, which was named as a respondent, finally answered down the line that the relief was warranted and that it erred in denying a Site Development Permit for an annual rope barrier. Plaintiff then moved for $123,243.75 in attorney’s fees under California’s private attorney general statute (CCP § 1021.5) and $555 in routine costs. The trial judge granted plaintiff $82,717.50 in fees and costs, inclusive of the $555 in costs. Except for the $555 in costs, the fee/costs award was affirmed upon City’s appeal. City’s main argument that it was not an “opposing party” for 1021.5 purposes, but this was incorrect because it was a named respondent and its actions were at issue. However, City’s real “spin” was that fees were undeserved because it confessed error early on. The appellate court disagreed, finding that this confession did not disqualify City as an “opposing party” and acceptance of such an argument would gut the catalyst theory of fee recovery. This determination was made in the published portion of the opinion. In the unpublished portions, the Court of Appeal found the award of fees for pre-petition work was no abuse of discretion, although it did strike the $555 costs award because plaintiff conceded that it failed to file the necessary costs memorandum pursuant to California Rule of Court 3.1700(a)(1). However, the appellate court did indicate that plaintiff was entitled to costs and fees on appeal, remanding the additional fee determination to the trial judge. Dept. of Parks and Recreation v. Schoendorf, Case No. H039321 (6th Dist. May 26, 2015) (unpublished). In this one, an appellate court denied $300,000 in attorney’s fees against the State under a settlement agreement where “reasonable diligence” governed the fee entitlement. Given that the prevailing party determination was discretionary under this clause and no one obtained a complete victory, little wonder that Civil Code section 1717 principles required an affirmance of the result in this encroachment case. After all, “reasonable diligence” does provide a great degree of discretion as to who prevailed, with the lower court decision being entitled to deference on appeal. Doe v. Dept. of Education, Case No. C072145 (3d Dist. May 26, 2015) (unpublished). This second case was one where plaintiff settled with one defendant, but had some technical victories as to the California Department of Education (CDE). Ultimately, however, plaintiff did not win as to CDE based on administrative exhaustion arguments. Although plaintiff sought $840,000 (2.5 multiplier on the lodestar), the trial court denied the request, a result affirmed on appeal. Reason: Plaintiff was not “successful” as against CDE, with a pragmatic standard showing plaintiff did not prevail in the case as to this particular defendant. Robles v. McErlain, Case Nos. A139331/A139532 (1st Dist., Div. 4 May 26, 2015) (unpublished). The third cause was an attorney’s fees award in a harassment injunction proceeding, with there being fee entitlement and no necessity to provide good faith as an element. (Code Civ. Proc., § 527.6; Krug v. Maschmeier, 172 Cal.App.4th 796, 803 (2009).) The appellate court rejected the idea that detailed billings are required as substantiation under California state law, because an adequate declaration from an attorney as to work will suffice. However, the reviewing court did reverse a 20% multiplier “bump” given that the case was not complex and not taken on a contingent basis—such that the lodestar factors adequately addressed any fee request and dispensed with the necessity of any positive enhancement. Plaintiff Ultimately Lost Merits At Demurrer Stage. In Merrill v. County of Lake, Case No. A140744 (1st Dist., Div. 3 May 21, 2015) (unpublished), plaintiff won a short-lived preliminary injunction in a challenge to a restrictive marijuana cultivation ordinance, but later lost at the demurrer stage. Plaintiff moved to recover lodestar fees and costs of about $74,000, a request denied by the trial judge. The appellate court affirmed on three grounds. First, plaintiff ultimately did not succeed by failing to vindicate the constitutional challenge to the ordinance. Second, plaintiff failed to provide proof as to whether the challenge benefited the public or a large class of people, failing to submit evidence on the number of medical marijuana patients helped by the injunction. Finally, plaintiff failed to meet the financial benefit/cost element by failing to show that his personal interest did not prevail—the money he made from the marijuana crop harvest during the injunction was not disclosed so as to weigh it against the $74,000 in lodestar prosecution expenses. 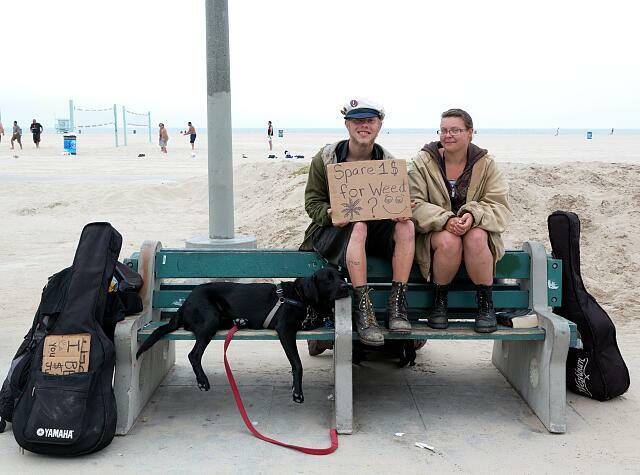 “Spare 1$ For Weed?” Carol M. Highsmith, photographer. Venice Beech, California. 2012. Library of Congress. However, Trial Judge Did Not Abuse Discretion By Reducing Lodestar And Awarding No Multiplier--$145,747 Fee Recovery Affirmed. In Keep Our Mountains Quiet v. County of Santa Clara, Case No. H039707 (6th Dist. May 7, 2015) (published), a plaintiff winning a CEQA case—with the lower court acknowledging a development project was invalid without an EIR—was awarded $145,747 under CCP § 1021.5, but short of the requested lodestar of $176,184.50 and an additionally requested 3.0 multiplier (a total request of $308,322.87). Both sides appealed the fee award, and both sides went away with no more relief. Under CEQA, a winning plaintiff does confer a significant benefit when a court says an EIR needed to be conducted—this was not a “minute” blemish, but a significant win requiring proper environmental assessments. The general public, too, was served given that biological resources and public roadway safety are matters of general interest. Finally, the nonprofit plaintiff organization only obtained indirect financial awards, such that the financial costs/benefits favored an award. That took the appellate court to the amount of the award. The problem here was that the record showed no abuse of discretion. Plaintiff believed that the trial court was wrong because it found the partial contingency arrangement did not allow for a multiplier, but the reviewing court found no support in the record for this notion. Attempts to Settle With Others—But Not The Right Agency—Did Not Carry The Day. Plaintiff filed a petition/complaint aimed to make the California Department of Fish and Wildlife reopen a Riverside County mirage trail in an ecological reserve. The defense demurred, which was sustained after new California legislation allowed the Fish and Game Commission discretion to determine seasonal openings/closures of trails such that plaintiff’s lawsuit was moot. Plaintiff moved to recoup $100,000 in fees under CCP § 1021.5 against the defense. The trial judge denied the request on the basis that, although making some settlement overtures to the Department and the Attorney General, plaintiff did not attempt to settle with the Commission, the entity having ultimate decision-making authority. The fee denial was affirmed in Carian v. California Department of Fish and Wildlife, Case No. D066683 (4th Dist., Div. 1 Mar. 9, 2015) (unpublished). The problem, as the appellate court perceived it, was that plaintiff did not attempt settlement efforts with the right agency. Because plaintiff was relying on the catalyst theory articulated in Graham v. DaimlerChrysler Corp., 34 Cal.4th 552 (2004), it was not determinative that settlement efforts were made with other agencies given that the Commission was the ultimate authority under applicable statutes to allow or disallow access to the trail. So, had plaintiff contacted the Commission, the dispute might have been resolved, with the trial court’s decision on this ground being no abuse of discretion.